Still from Marvel’s Luke Cage. Global super-brand Marvel has a long history of awkwardly addressing zeitgeist-y sociopolitical flashpoints. In the near-apocalyptically tense year of 1968, co-writers Stan Lee and Jack Kirby took on countercultural protest by having Thor tell a bunch of hippies to stop lazing around and fight for change within the system. While Richard Nixon flailed, Macbeth-like, in the final months before his resignation, a Captain America story written by Steve Englehart depicted him secretly working for the supervillain organization the Secret Empire. As activists struggled to put gay rights on the national agenda in the early 1990s, a heroic mutant named Northstar came out of the closet by declaring, “I am gay!” during a fistfight. The tales were well-intentioned and left of center, but all too often induced cringes rather than nods of agreement. 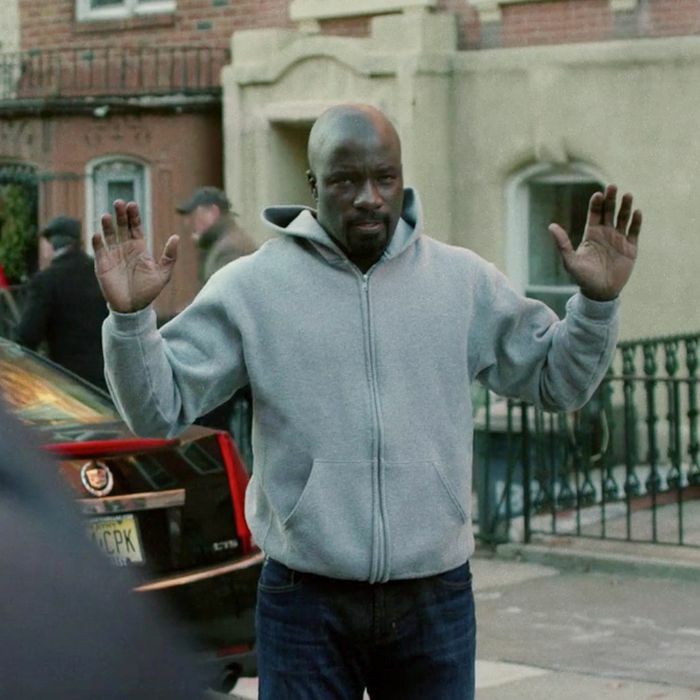 So when showrunner Cheo Hodari Coker started talking to reporters about the political aims of his Netflix superhero saga Marvel’s Luke Cage, some degree of skepticism was inevitable. The show has an overwhelmingly black cast of characters led by a near-invulnerable guy in a hoodie, and Coker planned to make color a central point of discussion. “The world is ready for a bulletproof black man,” Coker said at San Diego Comic-Con. “I don’t care what your socioeconomic status is, if you’re a black man in a hoodie, you can be misinterpreted,” he told KPCC’s The Frame just before name-checking Trayvon Martin. The show’s finally out and, as promised, it walks into the thorny thicket of post-Ferguson discussions about police bias against black men. The result is a boldly provocative collection of statements and set pieces, but the message gets muddled by a few confusing narrative choices. Superhero narratives are, more often than not, built on bluntness: Characters clearly lay out what they mean and intend and the images depicting them are designed to be understood in an instant. Luke Cage is not an exception. The first time we see the instruments of government cracking down on a black man, the visuals do not aim for subtlety. The season’s ninth episode, “DWYCK” (both the title of a Gang Starr song and an abbreviation for the hard-luck command, “Do what you can, kid”), sees the title character on the run from the law after he’s been framed. While walking the streets in a gray hoodie, a pair of cops (one white, one black) find him and, as their dashcam rolls, they hold him at gunpoint. While a blurred-out gun floats on the screen’s left-hand foreground, Luke holds his hands up, evoking one of the most famous gestures of the Black Lives Matter movement. He apologizes for what’s about to happen before knocking out the white cop, after which the black cop fires round after round into Luke’s bulletproof back. He then walks to the shooter and smacks him with superhuman strength, sending the man flying into the windshield of his patrol car before walking away. His face twists into a grimace, suggesting that he’s unsure of the morality of what he’s just done. One shares his ambivalence. Sure, this is the story of a superhero — he has to get away from those who threaten him so he can reach the story’s climax. But it’s disorienting to see a burly man of color attack two police officers so brutally. It’s hard not to think, just for a passing moment, of officer Darren Wilson’s description of the late Michael Brown as a kind of superhuman, a “demon” who struck mortal terror into the gunman’s heart. Of course, this is surely not the intent of Coker’s team, but it gets the show’s interrogations of racially charged shooting off to an awkward start. As we see in a disturbing and effective montage, Jake and his subordinates launch something resembling a neighborhood-wide stop-and-frisk campaign. Cops go after young men of color en masse, chasing and manhandling them indiscriminately. We’ve seen versions of this montage countless times before in action movies and procedurals: A hero or villain searches for a key character by rounding up the usual suspects and harshly questioning lowlifes. But here, it’s made chillingly subversive. Instead of seeing the recipients of this questioning as a series of faceless criminals, we understand that a police search for a black man in a predominantly black neighborhood would lead to a racially charged crackdown. “Do not light up Harlem behind this,” Priscilla tells Jake. “The good people in Harlem have no problem with me,” he says, “just the assholes.” In this case, the assholes are anyone on the street who happens to be dark-skinned and male. Here’s where things get weird. Mariah begins to use Lonnie’s beating as a political chip. “He was beaten in custody, like it’s 1956,” she tells reporters. “All over Harlem, young black and brown men are being slapped around by an NYPD too scared to do something about Luke Cage.” But her solution is a self-serving one. She rallies to “encourage the NYPD to effectively arm themselves to protect the public, not to harass young brothers and sisters,” and she knows just the source for such arming. She and Diamondback have a secret plan to take out Luke and make a barrel of cash by selling high-tech guns to the NYPD — guns that can kill Luke. “I’m a politician, not a gun dealer,” Mariah tells Diamondback in an earlier scene. “Well, what’s the difference? Sell the fear,” Diamondback replies. “Those people need to look at that dashcam footage and ask themselves if the world is ready for bulletproof niggas that eat cops for breakfast. Black fear. After abolition, it’s how gun laws got enacted in the first place.” Although he’s oversimplifying (there was a relationship between early attempts at gun control and anti-black bias, but a wide array of other factors were at work), it’s remarkable to see any kind of discussion of that history in a superhero show. Nevertheless, because it is a superhero show, we know the speaker is a living embodiment of moral deficiency. No matter how tortured Diamondback and Mariah may be, we’re generally supposed to look at what they do and aspire to do the opposite. That’s what makes Mariah’s next move a confusing one for the viewer. She stages a rally demanding justice for Lonnie, one in which people carry signs that may not read “Black Lives Matter,” but which certainly evoke that breed of collective protest. “Now, I know what brought us here tonight: The police putting their hands on yet another young black man,” she says to the crowd. She notes that she doesn’t blindly trust cops, but that her fellow protesters can’t lose sight of “the real threat,” echoing the statement she made earlier to reporters: “Powered people like Luke Cage.” Her proposal? “We need to arm our men and women in blue so that they can protect us.” Perhaps we’re supposed to see Mariah’s logic and tsk-tsk over the fact that she’s pushing for police power, not against it. Nevertheless, it’s an odd choice to have the show’s one scene of rallying against racist violence simply be the cover for Mariah’s sinister plot. The final story element involving police suspicion of young black men is a little clearer in its convictions. After saving Method Man (playing, delightfully enough, himself) from a stick-up in a bodega, Luke and the venerable rapper exchange hoodies, and Method does an interview on Sirius XM’s “Sway in the Morning” during which he defends Luke’s decision to run from the law. “Bulletproof always gonna come second to being black,” he says, then adds, “Y’know, there’s something powerful about seeing a black man that’s bulletproof and unafraid.” He freestyles a few verses about how people of color are left behind by heroes like Iron Man and how Luke’s battle fits into a tradition involving Martin Luther King, Jr., Malcolm X, and Trayvon Martin. While he does so, we see a montage of black men who have chosen to don bullet-hole-riddled hoodies in a Spartacus-like attempt to prevent cops from finding Luke. Here, we see a community coming together to subvert the practice of profiling: If you’re looking for a black man in a hoodie, you’ll find that plenty such men exist, none of whom are your suspect. You’ll have to try a little harder if you want to pluck an innocent man. It’s a memorable and stirring sequence. But by the end of the season, when Luke turns himself in for the crime of escaping from prison years prior, we’re left with a confusing sub-narrative about one of America’s more pressing issues. The show certainly isn’t coming out in defense of profiling and police violence. But some of the most charged moments in the discussion of those topics — the shout-outs to Jim Crow apartheid, the depictions of justifiably angry protest — fall flat because they’re ones in which baddies are acting as puppeteers. Perhaps the best way to look at all of this is by thinking of a line Luke gives in the finale. “I haven’t done any of the things that I’ve been charged with,” he tells Priscilla at the precinct house. “Even the dashcam video that everyone’s talking about? I’d like to provide some context.” The messaging, despite its contradictions, is admirable for the racial context it adds to the woefully apolitical superhero genre.